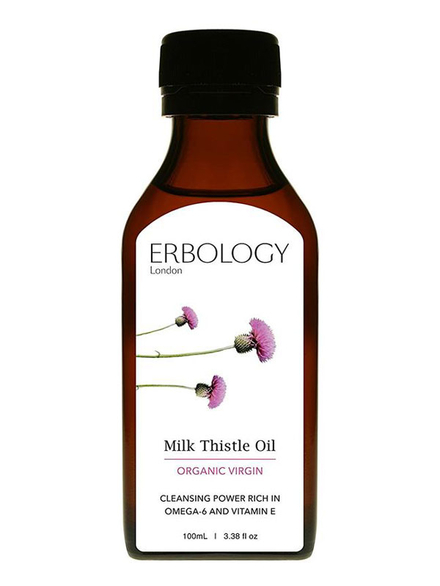 Virgin Milk Thistle Oil, Organic 100ml (Erbology) - HealthySupplies.co.uk. Buy Online. Good source of antioxidants, omega-6, vitamin E and silymarin. Take as a supplement or use as a condiment. Free from allergens, preservatives and artificial colours. 100% Virgin oil made from the fruit of the milk thistle. Erbology Organic Milk Thistle oil is made from hand-harvested organically grown Milk Thistle fruits. The fruit is cold-pressed shortly after being harvested and the oil is naturally extracted. This method of extraction ensures all the goodness is retained and ensures you receive the maximum health benefits. Milk Thistle is a rich source of Vitamin E, phytosterols, and linoleic acid – an essential fatty acid that is part of Omega-6. If you are taking this oil as a dietary supplement, we recommend you take one full tablespoon (approx. 10g) per day. However you can use this as you would other cold pressed oils. It tastes great drizzled onto savoury dishes or as part of a salad dressing.